Below are FOUR caddisfly recipes. In each case, woodchuck fur (underfur, guardhair, or both) is one of the ingredients. Eric Leiser is credited with having popularized this pattern. Articles he has written make it clear that he was a great fan of woodchuck as a tying material. Hook: Photo shows size 14 Tiemco 100. Thread: Color and size to suite. Photo shows Danville 6/0. 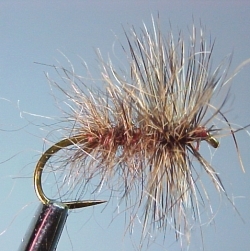 Hackle/Legs: Dry fly hackle to match the hatch. Photo shows about 12 wraps of cree colored rooster saddle hackle. Woodchuck underfur is a beautiful golden tan. It makes an excellent downwing, but you will need to treat it with flotant. Body: Bare thread or thin dubbing. Wing: Clump of woodchuck underfur. (Remove the guardhair from the fur to leave just the underfur for this downwing. Don't worry about a few stray guardhairs. 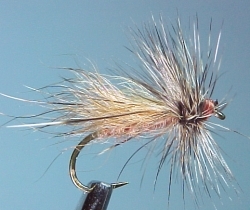 )Hackle/Legs: Dry fly hackle to match the hatch. Photo shows cree-colored rooster saddle hackle. Hackle/Legs/Head: Clump of elk or deer hair, butts tied down behind the eye and clipped to form the head. Abdomen: Dub the rear half or two-thirds of the hook shank with woodchuck dubbing made from underfur. Directions for making dubbing are in the article Working Wonders With Woodchuck. I used the dubbing-loop technique here. 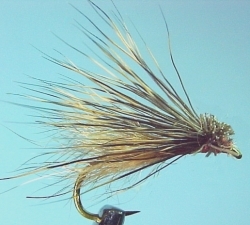 Hackle/Legs: Dry fly hackle to match the hatch. Photo shows cree-colored rooster saddle hackle over the front half to one-third of the hook shank.